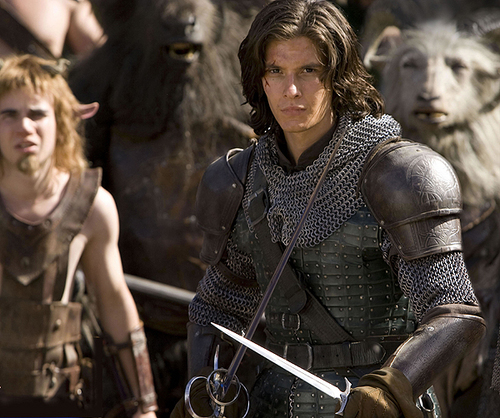 There was a massive auditioning process for Prince Caspian, right? Right, but not for me. I think they’d be looking for about a year and I came in in about the last three weeks. One of the casting directors had seen me on stage in The History Boys and asked me to come and do one scene. And Andrew Adamson just liked the way that I said one line. I’ve no idea! I need to work that out… He said you’re the only person I’ve seen in a year who’s done that with that line. Did they train you up to swing swords and ride horses? Literally, as soon as I got to New Zealand I drove to a horse-riding centre before I even met the cast. I had six hours a day of horse riding and sword fighting for a couple of weeks. But Caspian isn’t actually a gung ho character. He’s anxious about growing up and fighting this cathartic fight against his own people. He’s actually quite vulnerable in that way. He’s deeper than that. [Pauses] Not that I don’t look cool on the poster, cos I do! [laughs]. How hard is it to ride a horse while swinging sword? I never actually fell off, but it’s tricky. Well, for the fellas, anyway! I had some uncomfortable incidents in the first few weeks until I bought my padded cycling shorts… But by the end of it I was riding through rivers, running down ramps with flaming torches, swinging swords… A little boy’s dream. Was a there a competitive streak between you and William Moseley, who plays Peter Pevensie? Ha. There was a lot of competition there. But William was probably better than me at most things, to be honest. Yeah. But my sword was longer! It would rile him up a treat. How come yours is longer? [Shrugs] It’s just the way it is, mate. Just the way it is. One day on set, we’d been arguing about this for a long time and Glen Stom – who plays by Cornell John – came up on his power-risers wielding this five-foot long sword. And I just looked at him, looked at Andrew, looked at William and just said, ‘Argument over.’ So that was the end of that! But that tension is very much in the script so it was great. What do you think of the monsters? The difference for me is that they really individualise them all now. You see how the different creatures fight. The minotaurs barrel in with these big clubs, the centaurs swing these huge swords. And fauns do a bit of parkhour, because they’re got goat-legs so they can spring about and jump on this stuff. That looks really cool. Is it weird acting with CG characters like Reepicheep who aren’t actually there? Usually you can get an actor on his knees to play a badger or something. But Reepicheep is so small that you just have to talk to a wire with a little dot on the top. Little wire, dangling in front of you, and you’re literally talking to that. Emote! Yeah, yeah… Look in my eyes! Where are yours? So that was one of the big challenges for me. But the Centaurs and Minotaurs are real men, though? Yeah. These are big, hard blokes. All the Minotaurs were like 7ft fall. And I think two of them were cage fighters. Centaurs had three hours of make-up and the minotaurs have big animatronic heads on. When they took them off you could see the steam coming off them. To stand in this really hot field in a full fur suits with a head attached and fight, it’s a big ask. They took their heads off and they looked like they’d been swimming. What was an average day’s filming like? So I have a 7ft cage fighter on one side. And then there’s a dwarf. And then a guy on power-risers who’s pretending to be half-horse. And a 12-year-old girl. And then there’s me. It was literally like being in a different world. Nothing surprises you after a while. You’re surrounded by men in lyra green tights. And it’s normal. I mean, that’s weird.